We recently returned from a trip to Iceland and were immediately hit by a bout of post holiday blues. We were in dire need of something to cheer ourselves up (I know – First World problems huh)! 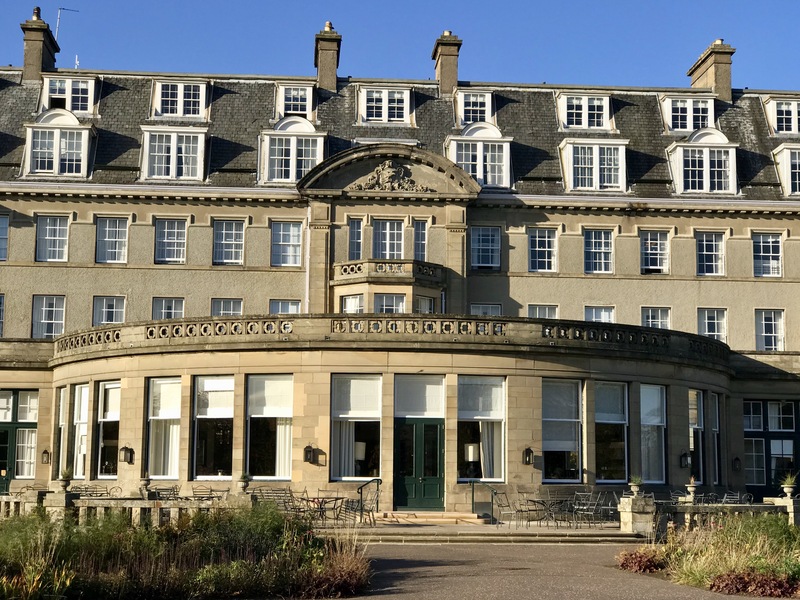 Luckily, the day after our Icelandic adventure ended we had a reservation for afternoon tea at Gleneagles Hotel in the heart of leafy Perthshire. Five-star luxury dining in plush surroundings seemed like the perfect way to lift our spirits. So, swapping hiking boots for driving shoes and down jackets for Harris Tweed, we toddled off to Gleneagles to feast on cake. I was still pining for the lava fields of Iceland as we wound our way towards Perthshire. It was a beautiful blue sky day, and as we drove through the tranquil Glendevon my mood was lifted by the stunning autumnal scene which greeted us. The rich colours of autumn were everywhere, and the glen was a riot of russet and gold. Gleneagles sits in extensive grounds, beautifully framed by a backdrop of hills. It’s hard to believe you’re less than an hour away from the hustle and bustle of Edinburgh and Glasgow, as there’s a real remote feel to the place. The hotel opened in 1924 at the height of the roaring 20s. Today, the period decor has been tastefully maintained, giving the interior a classy and elegant look. Ambient lighting, plush carpets and comfortable couches make Gleneagles the kind of place you long to linger – it’s incredibly relaxing. We were greeted warmly on arrival and shown to our table in The Glendevon. It’s a beautiful room with stunning views of the pretty, Perthshire countryside. I adore the historic cafes of Paris and Venice and The Glendevon reminded me of the best of them – memories of enjoying champagne and mille-feuille at Les Deux Magots in Paris, and ice-cold Aperol Spritz and devilishly moreish canapés at Caffè Florian in Venice came flooding back – ahhh, happy days. Our table added to the Continental feel of the place. Set in an alcove on a raised platform, it was perfect for that popular Continental pastime of people watching. We perused the afternoon tea menu for all of 30 seconds before our minds were made up. It was the Rosé champagne afternoon tea for me (priced at £ 57.50 per person), and for designated driver Mr G the Signature afternoon tea (priced at £40 per person). I waffled some nonsense about not really fancying a drink, but opting for a glass of fizz in the name of blog research. Mr G shot me a look which said ‘I didn’t come down in the last shower’. Clearly I was fooling no one! No sooner had we ordered, than our drinks arrived. An elegant, silver pot of good quality coffee each, and a chilled glass of rosé Veuve Clicquot for me (all in the name of research)! Our food quickly followed and each tier of our cake stand was explained to us. It all looked delicious. As advised we tucked into the tier of warm savouries first. Delicate pastry pinwheels with haggis inside, rye bread with prawns in a light Marie Rose sauce and sausage rolls. I tried the meaty treats first and they were exceptionally good. I prefer savoury to sweet, so these were a welcome addition to afternoon tea for me. Finally, and tentatively I tried the prawns on rye bread. Until that afternoon I’d never eaten a prawn before. I’d always hated the look of them and was convinced I wouldn’t like them – I was wrong. Sticking with savoury treats we tackled the sandwich tier next. They were delightfully, dainty and Mr G began wolfing them down like a man possessed. Fearing he would devour our entire afternoon tea in 5 minutes flat I pleaded with him to slow down and try a rich and (hopefully) filling cake instead. 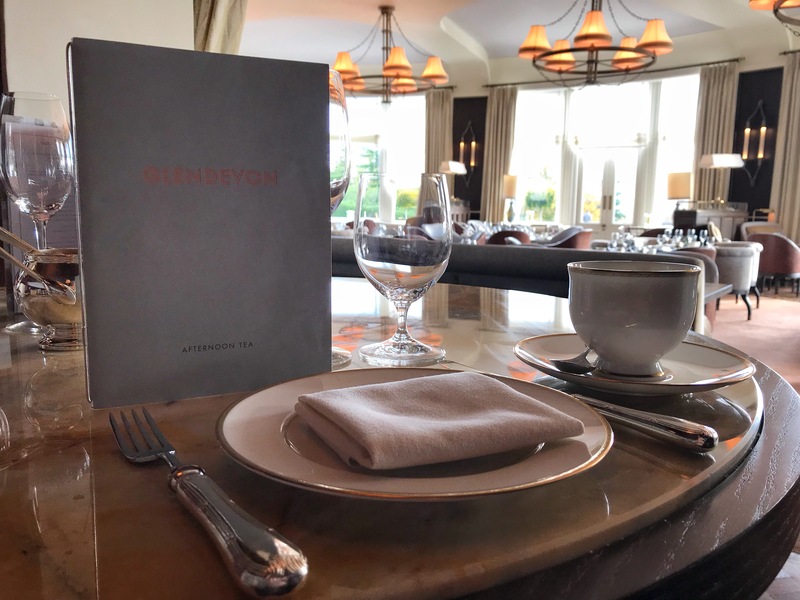 I ate my sandwiches at a more leisurely pace, enjoying the flavours and soaking up the lovely ambiance of The Glendevon. My favourites were the egg and cress with shallot confit on white bread, and the cucumber and minted cream cheese on caraway seed bread. Mr G waxed lyrical about the smoked salmon with sweet dill mayonnaise on lemon bread, yet he ate it so quickly I’m surprised he detected any flavours at all. Much like the prawns, I’d been saving the tomato bread sandwich with Roast beef, horseradish and lettuce until last. I love roast beef, and I love horseradish but I like my meat wafter thin and what the French would probably describe as ruined i.e. extra well done. This roast beef was decidedly pink, and the slice inside my sandwich was more than generous. Yet, like the prawns I was pleasantly surprised when I tried it. After our savouries it was time for a sugar rush, but where to start? Our tier of sweet treats all looked so tempting. Mr G is probably the biggest trifle affectionado I know. He can eat a gargantuan portion without stopping to draw breath, so trifle seemed like the obvious place to start. Scottish strawberry trifle with vanilla genoise and wild strawberry mousse to be precise. It was perfect. The sweet treat that really caught my eye though was the Chocolate profiterole with raspberry crème mousseline and white chocolate namelaka – it was even painted with a tiny, delicate little dab of gold leaf. Eating gold is the absolute height of Sunday afternoon decadence in my opinion. I thought the profiterole would sink me without a trace, but the choux pastry was as light as a feather. I decided I liked eating gold and could quite easily get used to dining on it! We still had tasty looking Pistachio macarons and Passionfruit meringue tarts to sample but we decided to take them home in a doggy bag and move on to our favourites next – scones. A tier of freshly baked warm scones was promptly delivered to our table, and our remaining sweet treats were whisked off to be boxed. I’ve been known to rave about scones on this blog before as I’m a bit of a fan. Last December the Royal Yacht Britannia earned themselves the accolade of best cheese scone ever. Well, I can now confirm that Gleaneagles make the finest non-cheese scones ever! The warm fruit and plain scones we were served with fresh cream and Scottish preserve were like little bites of heaven. I went into raptures about them. After finishing our veritable feast (or as much of it as we could eat) we said our goodbyes and headed out into the autumn sunshine clutching a doggy bag each. Now fit to burst, our blood coarsing with sugar we were in serious need of a lie down. Who knew so many tiny treats could be quite so filling. Even Mr G the bottomless pit was full. Before heading home we enjoyed a wander in the hotel grounds. They were beautiful, and we felt carefree and happy – our post holiday blues had been chased off by a wonderful afternoon at Gleneagles. We drove home chatting excitedly (sugar high) about our day. We definitely needed to have afternoon tea at Gleneagles again, and soon. Maybe next time we’d linger longer too, as what’s not to love about a beautiful area with lots of great walks, and a fabulous five star hotelto love? Back home, our darling boy greeted us with a fine display of jumping and some impressive laps of the dining room table, before noticing our doggy bags and eying them intently. The Teen greeted us with a barely audible grunt, and also eyed our doggy bags intently. It turns out they were both in luck as inside were sweet treats for The Teen and a slice of lovely roast beef for the Wee White Dug. Much like his Dad the boy hoovered his treat in record time – I’m not even sure it hit the sides on the way down. I’d like to end by thanking the fabulous Gleneagles Hotel for inviting us to afternoon tea, and looking after us so well during our visit. Although our afternoon tea was provided on a complimentary basis, all information contained within this blog is accurate and opinions are entirely my own. Hello – I just found your wonderful blog – it was recommended by Visit Scotland. Congratulations! I can only hope the fame hasn’t gone to the wee one’s head – it did look as though he was basking in the adoration from of his fans when you stopped at Eilean Donan in October. Although I understand that Westies don’t usually suffer from lack of self confidence. I will enjoy following you, Mr G and, of course, the dug. Take everything away and just feed me scones. I lurve scones. Annabell makes good scones, but I am not a fan of cream nor jam, – scones and butter get me every time. Yes, well, I bribe very easy :o) I am glad the Wee White Dug enjoyed his Doggy Bag treat. Mmmmmmmm looks and sounds divine. I totally agree about being full up on what looks like a few wee pieces and a bit of cake. Happens every time. It’s good they do doggy bags though. It sounds just my sort of afternoon tea, so much choice. Prawn mayonnaise is my favourite sandwich ! Thank you, so glad you enjoyed reading. I know you’ll love Gleneagles when you visit. Wow! Lucky you, sounds amazing. We have a wedding anniversary coming up, now let me think, where could we go?!! Oh, this was so painful to read! My taste buds are aching! And longing to go to Gleneagles for tea! I enjoy reading about the wee white dug’s adventures so much! We are in a rural farming community on the East Coast of the Canadian Maritimes, and hope to visit Scotland in our future travels. 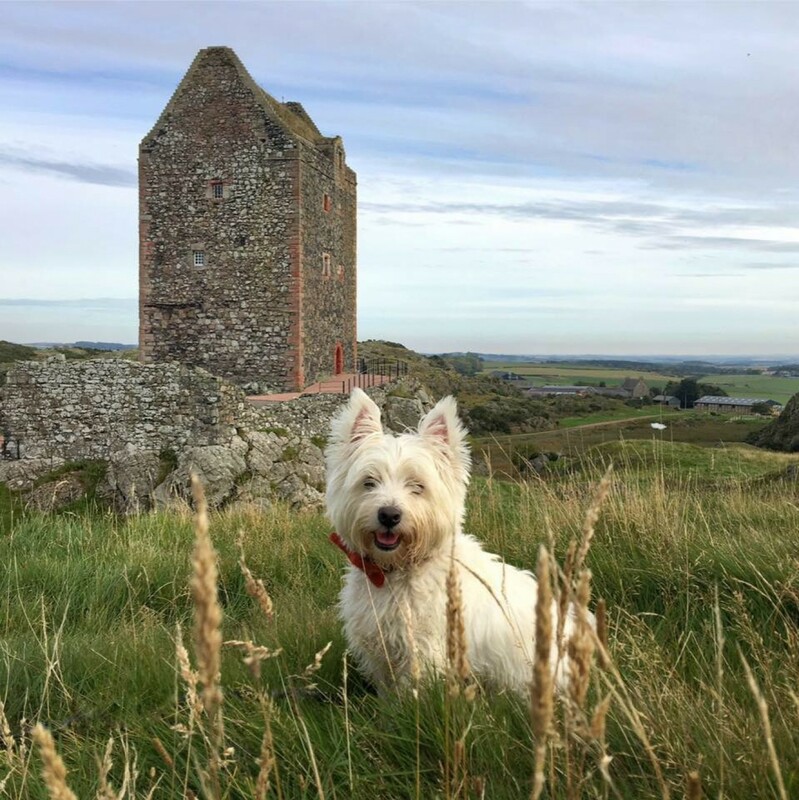 In the meantime I am living vicariously through your postings and blog – give the wee white dug a cuddle from me as I await your next adventure. Thank you so much. It’s lovely to hear you’re enjoying the boy’s adventure around Scotland. I hope you get to visit soon.